Not pictured: The Secret Place on audio, and The Shore on my e-reader (because Shannon said it's excellent!). I'll also be reading for charity this time around. In the past, I have donated to various literacy charities around the country (FirstBook, Room to Read, etc.). This time around, I've selected a books-related project on DonorsChoose.org, a website that allows teachers to request support for their classrooms. I've specifically selected a project to fund a reading library for a 5th-grade book club in Maryland. Who else is participating... and what will you be reading? And if you're reading for charity, who are you supporting? I'm taking part and reading for Beanstalk,a UK charity that provides literacy programs for schools. So excited! 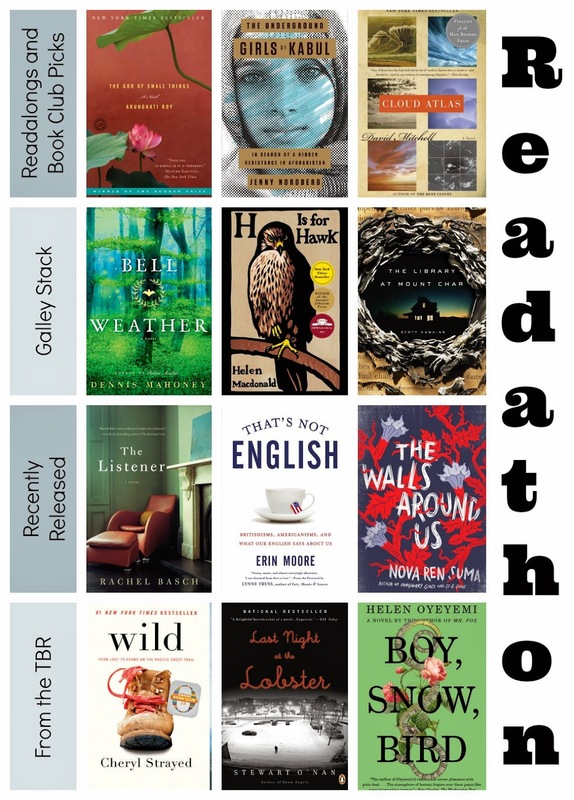 Have a great readathon! Awesome! I'll have to check out Beanstalk--I'm not familiar with it but I love literacy programs in general (for all the obvious reasons). Happy reading! I love this book list, Kerry! I want to read so many of those. I'll get my list posted sometime soon... possibly tonight. Also, love the charity idea! I have yet to do that for the readathon, but I'll likely look into it for next time. Money is short right now with the Europe trip coming up! My list is way too large for one day, but I like to have variety on hand :-) And I totally understand on the Europe trip savings... when do you leave!!?? We are gone June 1-17. Naturally we changed our agenda since I talked with you about it last a couple months ago. We are now (and officially, because it's booked) going to London, Bath, Cardiff, Paris, Munich, and Salzburg. There were a couple booking issues with Italy so we just swapped it for German and Salzburg, haha. Yesssss awesome! I can't wait for pictures! You were not wrong about having a huge stack haha! I'm surprised you're not going for more tiny book. That was my aim. THOUGH, I haven't done this before, so I actually know nothing haha. I guess I'm just scared of not finishing a book. I was super tempted to add Wild to my pile, but I had to control myself. One day I'll get to you, Cheryl. One day. Good for you for reading for charity! That's awesome. I love your graphic - and your choice of books! The only one I've read is Wild...very good. And I have Girls of Kabul and Last Night at the Lobster on my TBR. AND - The Shore - have that on e-reader and can't wait to start it! I was drawn to it b/c of the setting (I got married in a tiny Chesapeake Bay/Eastern Shore town in VA that sounds very similar to where the book is set) and am now even more excited since Shannon said it's great! Wish I was participating in the readathon , but I figure it's a lost cause with a 4 yr old and a 2 yr old. As soon as they get a bit older, though, Im IN! That's Not English is perfect for the readathon! Short and light and funny. Plus you could very easily read it in small sections if you need to take breaks form something heavier. Hope you have a great readathon!! Impressive list! I loved Wild, but it is a dense read. Seemed like it took me forever to get through even though it felt like I was constantly reading it. The Shore sounds so interesting, and Shannon's love of it I think has several bloggers moving it up on our lists! Totally understand about readathon-ing with kids (well, I can imagine, anyway), but hopefully you get some reading time this weekend! That's what I'm hoping for. I have a few dense and heavy books on here, so wanted to try to have a couple shorter and lighter options. Happy readathon-ing! I love that even within DonorsChoose, there's so much variety in each of the projects. And glad to hear good things about H is for Hawk! I've had my eye on that one. Good books! That's Not English is a fantastic, quick read, and you know how I love Wild. Great stack! The Walls Around Us is definitely a page turner. I love that you're reading for a cause! That's just awesome. I may have to do that next time.